Indonesian version of fried rice is called nasi goreng. Basically it has similarities with any other fried rice,it is made from cold rice which has already been cooked by boiling. The wok is heated until it starts smoking, with some oil. Rice is stirred quickly and uniformly to prevent burning, and to coat the rice grains with oil to prevent sticking. 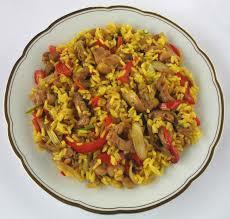 After 1-2 minutes the rice is flavored to taste and stirred thoroughly, then the other ingredients are added. chicken is nice, put that in your nasi goreng ... excellent!!! this one is only to satisfied my hunger on meat. and honorable mention to eat nasi goreng with kerupuk.